I'm new to this forum and am researching the traffic on Met and GCR lines pre-WWI, and can only see relatively recent stuff. Can anybody help, please, if any Met WTT or PTT have survived from this period? Have a look in the historic section below. I'm sorry, Roy, but I cannot see any "historic" section anywhere...? Depending where you live a trip to the National archives is a must as they have a lot of material. Thank you, yes, I have been through the indices for the museums in London but could not find anything. I have, over the years, been able to make copies of things held privately, which is a surprisingly rich source. What I have found from GCR sources is increasing cooperation between the two companies, with small steps before the Met & GC Joint was set up in 1904. Some of our more knowledgeable members may not come online very regularly. Sometimes people may crop up with an answer after a while. There’s such a wealth of knowledge on here! My main focus is as described above. Meanwhile, here's a picture (from an original I have) which I can best date as 1921+ showing Met No 108 with a Down train just north of Rickmansworth, whose outer signals are just visible in the distance. The sun angle is clear, from which I estimate the time to have been around 3pm in the afternoon (+/- about 15 minutes). If anybody has a WTT or PTT for the early '20s, we should be able to identify the working. The same photo is on page 90 of "Metro Memories" by Midas books, the caption states ".....City clerks all looking to a weekend of golf..." Unless it was taken on a Saturday, your estimated time might be a tad early? Cheers, John, although secondary sources such as books are not always reliable. Re the time of day, solar calculators are commonplace these days and you can check my estimate for yourself. The location can be found precisely via the OS 25" maps (try the National Library of Scotland maps.nls.uk/view/104202082), half a mile north of Rickmansworth station, at the foot of the climb to Amersham. Chorleywood is nearly two miles away, was "Chorleywood Bank" the name given to the whole of the 7 mile ascent? The LT estimate of 1925-30 is plausible although I would suggest a slightly wider one of 1921-30. 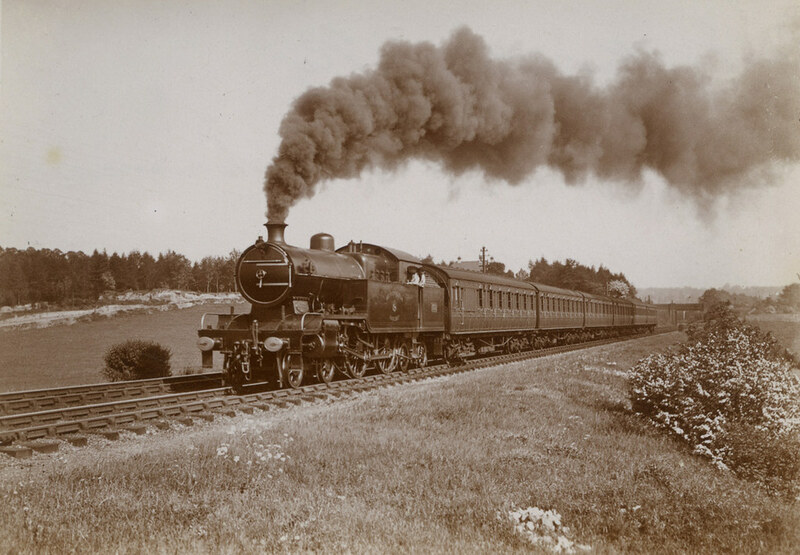 PS - A viewer on Flicker has identified the train as the 2pm (SO) from Aldgate, which left Rickmansworth at 2.58pm. Brian Hardy is a regular contributor on the FB "Metropolitan Railway past and present" and London Transport Old School groups.